Holds A3. Clear plastic, reinforced with mesh. With a coloured zip .. Holds A4. Clear plastic, reinforced with mesh. With a coloured zip .. Holds A5. Clear plastic, reinforced with mesh. With a coloured zip ..
2 ring Vinyl Binders Assort cols #1350..
3 ring Vinyl Binders Assort cols #1353..
Black - Display Books A4 vinyl cover 20 refillable sleeves ..
Blue - Display Books A4 vinyl cover 20 refillable sleeves ..
Black - Display Books A4 vinyl cover 20 refillable sleeves. 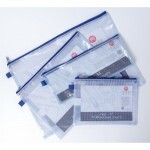 CLEAR FRONT ..
Blue - Display Books A4 vinyl cover 20 refillable sleeves. CLEAR FRONT .. 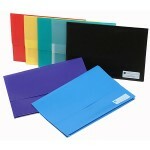 Document wallets Assort colours ..
Poly Pick Wallets Foolscap Bright ColoursDurable and tear resistant foolscap document wallets..
10 pockets at A2 size ..
10 pockets at A3 size ..
10 pockets at A4 size ..